What did you do Christmas Day evening? 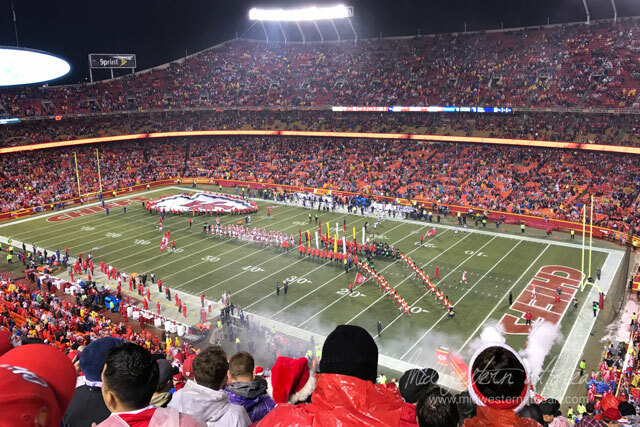 If you wondered what we did… we went to a Chief’s game. Why yes, we are just that crazy! Especially because the weather predictions called for 90-100% chance of rain and by golly, we got that. Every bit of it! This year was our year to have Tbug for Christmas Eve through around noonish on Christmas Day. The game was a night game so we decided that since we’d be done with Christmas festivities, we’d just head up for the game. We are season ticket holders after all. 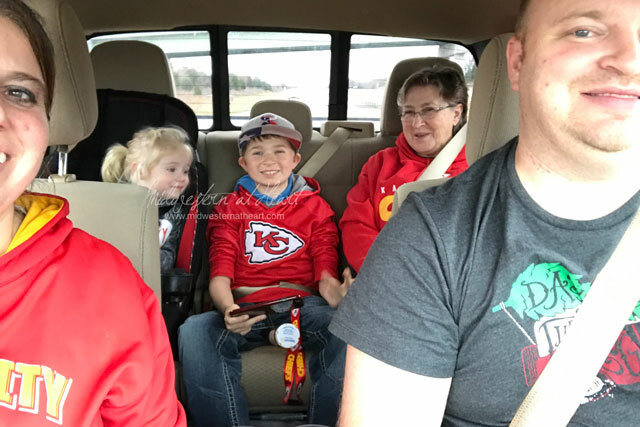 Grady had open heart surgery the Monday before Christmas so he wasn’t able to attend, so we “snagged” a couple of his tickets and took my nephew and mother-in-law up with us since we didn’t go to the game the previous week that we had tickets for them to attend (too dang cold! I think the high that day was like 5-10˚… NO THANK YOU) and I refused to let Abug stay home on Christmas. She’s young enough now, that she still gets in on our tickets (to sit on our lap). 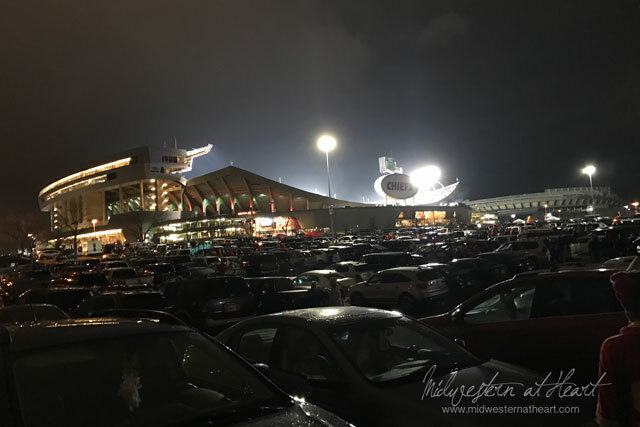 Normally when we attend games we’re there in time for the gates to open, but being Christmas and the fact we weren’t tailgating we decided to go up a little later. DANG was traffic horrible around the stadium. I think it took us 15-30 minutes just to get from the gate into our parking gate. Wow! Then we sat and waited because we got there around 5:30 or so and the stadium didn’t open until around 6:30 (give or take a few minutes). Carlene and Dan met us up there and saved us a parking spot. Carlene saw on radar that there was a rainstorm headed our direction so she went to get into the stadium a little early. We waited a few minutes behind her, then started putting on our cold weather gear (it was in the 40’s-50’s but the rain added a damp feel). Just as I got Abug situated on my shoulders to take off through the parking lot, the rain came. We had her rain jacket on her, hubby got the rain slickers on Memaw and Dill pickle and eventually himself and I just got soaked. We couldn’t pull Abug off my shoulders easily to get one on me and it was POURING. In fact, it was raining so hard I could hardly keep my eyes open. Let’s just say, the experience was interesting. We stood outside the gates for what seemed like forever. Abug refused to keep her hood up until her hair was soaked then she cried because her hair was wet but by this time we finally convinced her to put her hood up. We got inside the gates and I put Abug down to stand with hubby and ran to the bathroom. As I was walking by some lady looked directly at me and said, you’re just ridiculous. 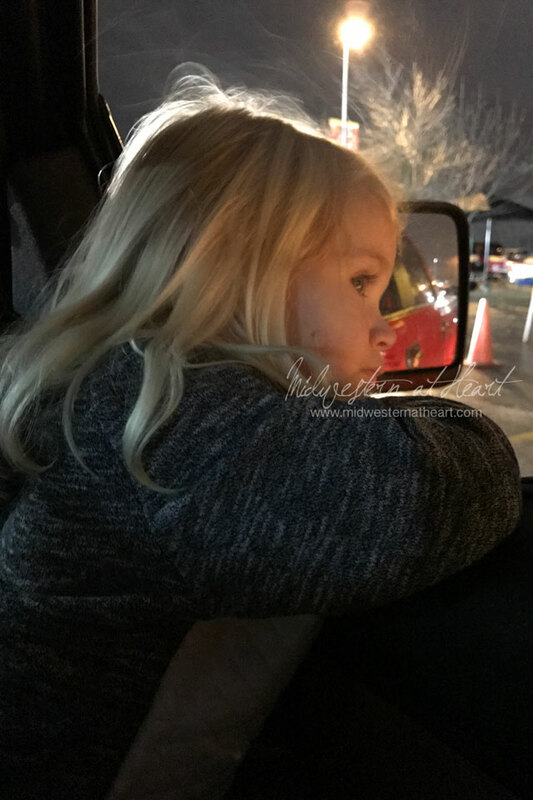 I sure hope she was talking to the person she was with…. And then it continued to rain. 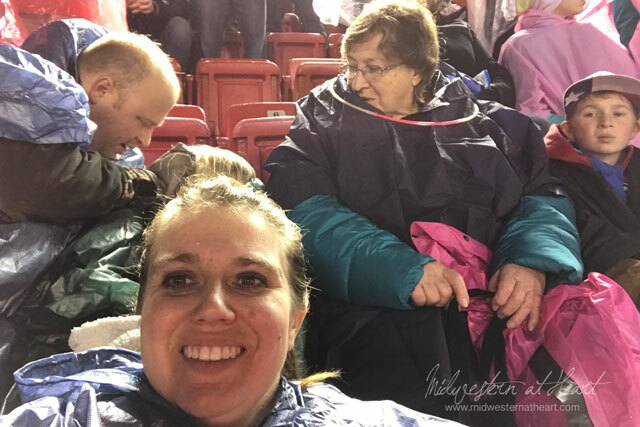 I wrapped Abug in a huge warm blanket and sat on the ground with her until just the last minute to go out to our seats (one thing we’ve noticed is all the enclosed stadiums are in places that don’t really need them for weather… like sunny California, Houston, Texas, etc….). Then we re-wrapped her in the blanket and put a rain slicker over her to keep her blanket warmer and dry. But I would like to say that our Chiefs played well. We beat the Denver Broncos! Go Team!!! We beat them with a score of 33 to 10. Yeah buddy! We left with about a minute and a half left on the play clock which was perfect. We were able to get out without sitting in a horrible amount of traffic. 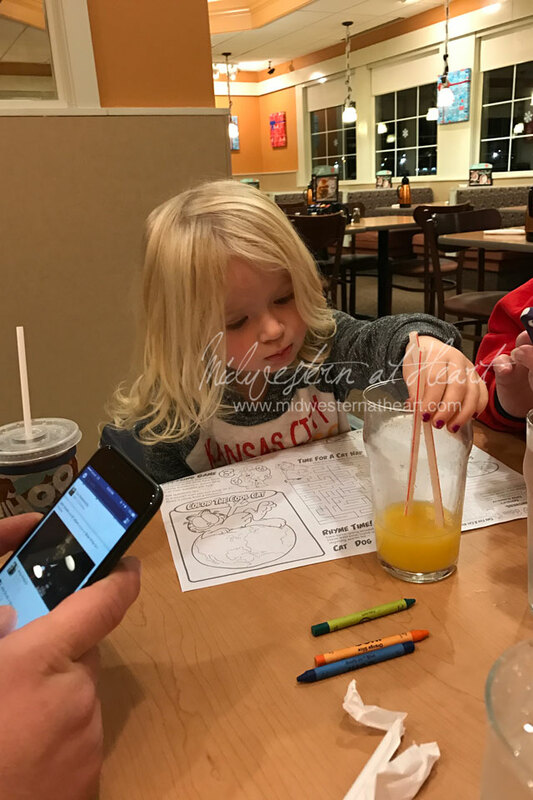 On our way home we stopped at the IHOP in Harrisonville and had dinner around midnight. Thank you to the employees who got stuck working on Christmas Day. You were excellent! I appreciate you! 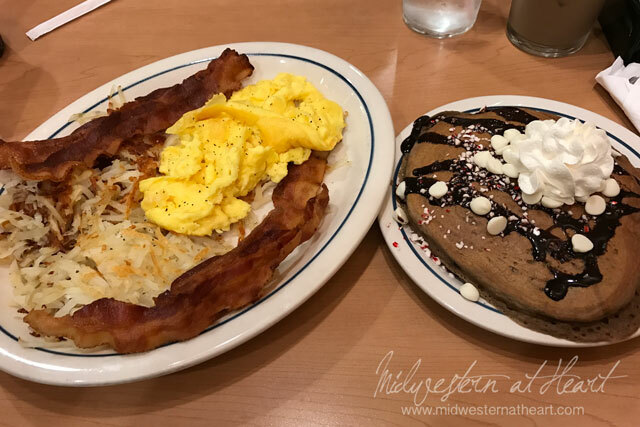 Hubby and I made a deal, he would drive us out of the stadium to where we decided to eat and then I’d drive the rest of the way home. I was so tired driving home that I woke him up and made him talk to me. As long as someone was talking to me, even if it wasn’t all coherent thoughts, I was at least awake. I also had a water bottle I was hitting against everything. That was a rough drive home. I was awake but oh so tired at the same time.